Watch this video. Let it blow your mind for a minute. It’s no shock that as we age, our senses diminish, from sight to touch and everything in between. 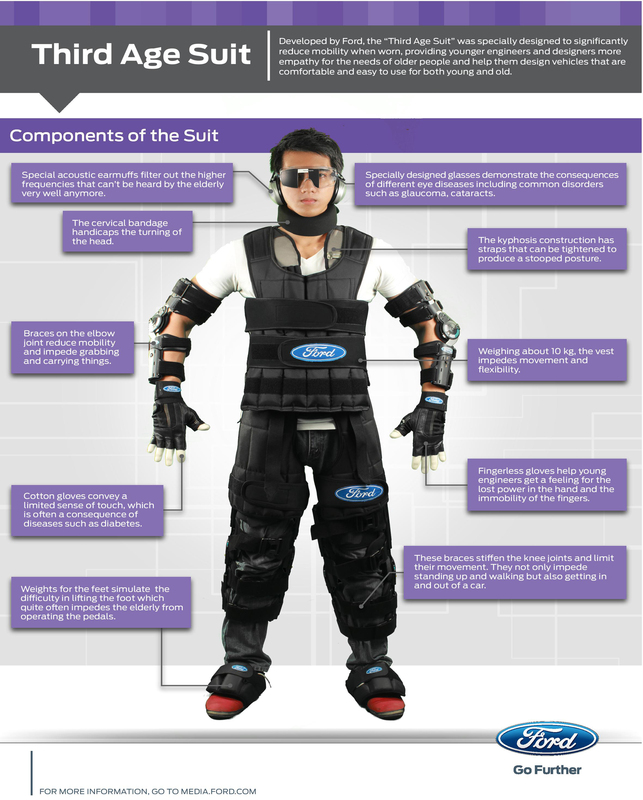 Enter the Third Age suit – Ford’s answer to limiting our limits as we age. This suit is used by Ford engineers to simulate an older person’s mobility (or lack thereof) by placing restraints on limbs, using funky glasses for the eyes, and wearing latex gloves for the tactile functions. Weights are also placed on the feet to replicate the heavy feeling of joints and limbs that are not functioning at 100%. First to be put on the engineer is a corset-type contraption to limit hip motion, followed by a shoulder brace to limit upper body dexterity. Next we have orthoses (used after trauma or injury to aid in aligning the joints to their proper postion – or, in this case, limit joint mobility); these are placed on the knees, elbows, and feet (with weights). Following the “joint immobilizers,” latex gloves are placed over the hands to limit touch due to diseases and disorders and fingerless gloves are placed over the gloves to limit hand mobility. Special designed glasses are worn to duplicate vision problems due diseases such as glaucoma and cataracts. Lastly, we have a full jumpsuit with a special thick collar to impede the mobility of his neck. In another article relating to this topic, it was mentioned that a mechanism also added hand tremors and specialized headphones. This wearable technology has already aided in the redesign of features in your vehicle I bet you never even thought about. If you have a newer car, take a look at your multi-media system’s volume knob or the temperature controls – bigger than the knobs of our youth, huh? This entry was posted in Culture, Ford, Technology and tagged ford, technology, Third Age Suit. Bookmark the permalink.